Entertain with ease or treat yourself to a gourmet snack with this thoughtfully selected assortment of charcuterie and cheeses. Featuring an assortment of Iberico Ham, Seranno Paleta, Barolo Salami, and Finocchio Salami as well as four specialty cheeses, this is the perfect spread for the connoisseur. 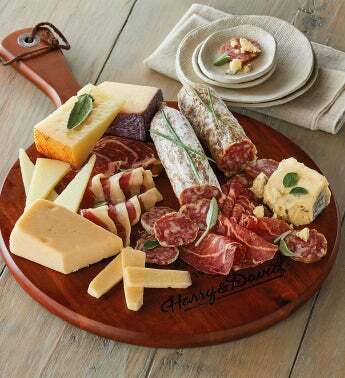 It arrives with a round acacia-wood cutting board with a handle for easy serving.